Check out this gently-used 2004 GMC Yukon we recently got in. Your buying risks are reduced thanks to a CARFAX BuyBack Guarantee. This is a well kept ONE-OWNER GMC Yukon SLT with a full CARFAX history report. This GMC Yukon SLT is an incredibly versatile vehicle that is a must have for any family. With 4WD, you can take this 2004 GMC Yukon to places roads don't go. It's all about the adventure and getting the most enjoyment out of your new ride. This 2004 GMC Yukon has such low mileage it has been parked more than driven. Marked by excellent quality and features with unmistakable refined leather interior that added value and class to the GMC Yukon Previous service records are included, making this GMC Yukon extra special. The interior of this GMC Yukon SLT has been through meticulous inspection and could almost pass for a brand new vehicle. This vehicle's tires have been thoroughly inspected and are classified as like new. Okaz Motors has a wide selection of exceptional pre-owned vehicles to choose from, including this 2004 GMC Yukon. When you purchase a vehicle with the CARFAX Buyback Guarantee, you're getting what you paid for. The CARFAX report shows this GMC Yukon is a well cared for One-Owner vehicle. Do so much more with one vehicle. This GMC Yukon gives you everything you need an automobile to be. Take home this GMC Yukon SLT, and you will have the power of 4WD. It's a great feature when you need to drive over tricky terrain or through inclement weather. This 2004 GMC Yukon has such low mileage it has been parked more than driven. 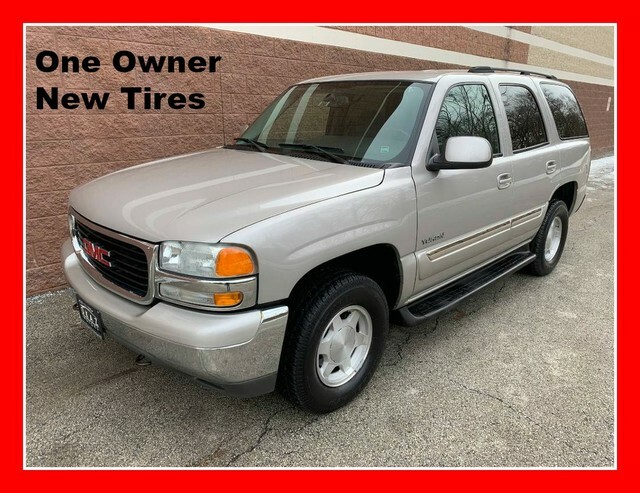 Marked by excellent quality and features with unmistakable refined leather interior that added value and class to the GMC Yukon Get a complete and detailed history at no charge on this wonderfully maintained pre-owned vehicle. This gently driven vehicle has been well-kept and still has the showroom shine. This highly refined GMC Yukon comes with exciting features you'd expect in a vehicle twice the price. With new tires, this vehicle is ready for miles and miles of driving. This outstanding example of a 2004 GMC Yukon SLT is offered by Okaz Motors. This 2004 GMC Yukon comes with a CARFAX Buyback Guarantee, which means you can buy with certainty. Do so much more with one vehicle. This GMC Yukon gives you everything you need an automobile to be. At home in the country and in the city, this 2004 4WD GMC Yukon SLT has been wonderfully refined to handle any occasion. Smooth steering, superior acceleration and a supple ride are just a few of its qualities. The Yukon SLT has been lightly driven and there is little to no wear and tear on this vehicle. The care taken on this gently used vehicle is reflective of the 113,923mi put on this GMC. Marked by excellent quality and features with unmistakable refined leather interior that added value and class to the GMC Yukon How often was the oil changed? Were important service intervals taken care of? You'll have the records on this vehicles to know for sure. Pre-owned doesn't have to mean used. The clean interior of this GMC Yukon makes it one of the nicest you'll find. This wonderfully appointed vehicle comes equipped with the options and features every driver craves. The brand new set of tires means that you will be able to drive off the lot without hesitation. You can drive off in the GMC Yukon SLT feeling safe and confident with these new tires.